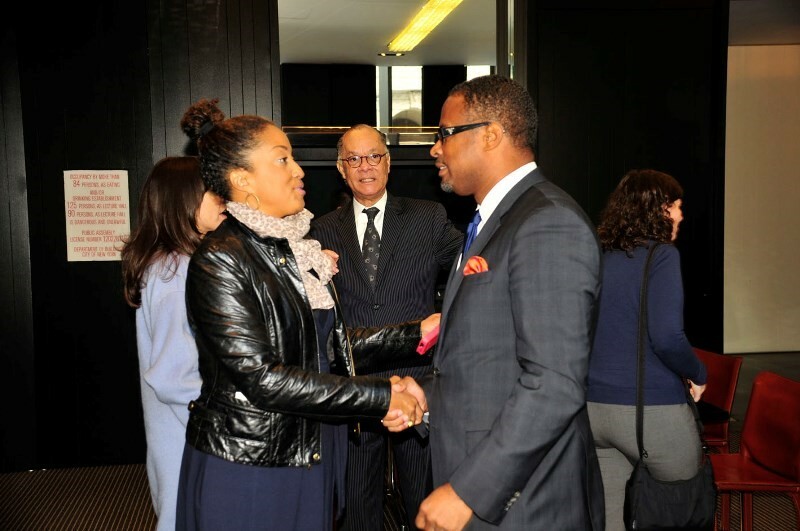 New York, NY, (November 03, 2014) — Nevis’ Deputy Premier and Minister of Tourism, the Hon. Mark Brantley accompanied by the Nevis Tourism Authority’s (NTA) CEO Greg Phillip, and NTA’s North America Manager Yvette Jackman, were in New York on a mission to promote tourism to Nevis in advance of the important winter travel season. The delegation was joined by Noreen Meguid representing The Mount Nevis Hotel, Laura Lehrman representing Montpelier Plantation and Beach and Tara McIntyre and Sydney Engel representing the Four Seasons Resort, Nevis. Responding to an NTA invitation that read ‘Nevis. On The Cusp of Becoming the Greenest Place on Earth’ were over 50 journalists from New York’s leading media houses, at a breakfast reception hosted to promote Nevis’ tourism product. The engagement was staged in a ‘talk show’ format with Minister Brantley and CEO Phillip giving opening statements, followed by a robust question and answer session. Noel Mignott, CEO of Nevis’ North America public relations agency, The PM Group acted in the role of presenter. Minister Brantley used the opportunity to communicate the transformative impact that tourism has had on the island and expressed his gratitude on behalf of the people of Nevis for the support from the press, telling them, “Nevis is not for everybody. We focus on attracting discerning travelers that are seeking a holiday that is uniquely Caribbean and with your kind help, we are getting this message out” proudly sharing the increase in tourism revenue and visitor arrivals over the past 24 months. The Minister also used the opportunity to tell of Nevis’ rich history elaborating on her start in tourism with the establishment of the Caribbean’s first hotel, the Bath Hotel, through the role of Nevis’ Alexander Hamilton in the history of the United States and more recently, the hope that Nevis’ capital, Charlestown would be given favorable consideration by UNESCO and named a World Heritage site. At the same time he seamlessly wove his way through the island’s hotel product, succinctly differentiating the attributes of each property. The high point of the Minister’s presentation was underlined when he spoke of the Nevis Island Administration’s vision for tourism development and in particular, replacing fossil fuel generation with renewable energy resources. “Besides reducing a country’s carbon footprint, concern about waste management is a particularly challenging issue for all nations” he said, sharing the news on Nevis’ initiative to create an environment-friendly solution for its waste management with the Baltimore firm, Omni Alpha. The audience welcomed this news, as Brantley gave details of the waste to energy agreement that will be coupled with the construction of a solar farm, to ensure that a targeted energy supply is met. “It is these developments along with the progress that has been made on developing our geothermal energy sources, that promises to make Nevis the greenest place on earth” he concluded. For his part, CEO Phillip reported on the special attractions that include the newly announced Blues Festival, Nevis Mango Madness, Nevis Race Week, the Nevis Fishing Tournament, the Booby Island Sailing Regatta and the Nevis Triathlon that all are helping to increase tourism visitor arrivals in the traditional “off season”. The audience was especially entertained when Phillip described horse racing in Nevis and drew comparison to Kentucky’s Churchill Downs. They listened keenly as he shared the history of Cottle Church, the first Anglican Church in the Caribbean, where different races were allowed to worship together. Publications that were in attendance included Travel+Leisure, amNew York, Millennium Magazine, American Spa, Brides, Conde Nast Traveler and Bloomberg News. During his visit, Brantley also held private meetings with AFAR Magazine, eTN News, Yahoo! Travel, Vanity Fair and GCaribbean among other media houses, while Phillip and Jackman joined the sales team for the Four Seasons Resort, Nevis, on meetings with leading members of the travel trade.